Crisis In Japan: Dead, Missing Total Rises Above 26,000 : The Two-Way The latest news from Japan, which is recovering from the devastating March 11 earthquake and tsunami. 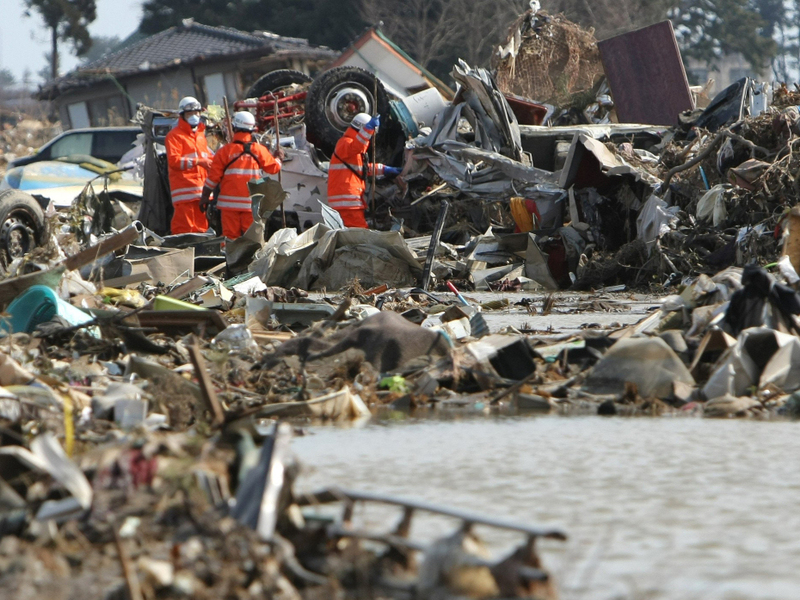 Rescue workers searched for missing people in Natori city, in Miyagi prefecture, earlier today (March 24, 2011). -- Nuclear Workers Exposed To Radiation: "Two workers at the Fukushima Dai-ichi power plant suffered injuries when their feet came in contact with radioactive elements while laying electrical cables in one unit, said Fumio Matsuda, a spokesman for the Nuclear and Industry Safety. NHK television reported that the workers' legs were exposed as they worked in a basement flooded with radioactive water. The two were being treated at a hospital. A third worker was also exposed to the high-level radiation, Kyodo News reports. But while the other two reportedly suffered possible radiation burns on their feet, the third worker did not. -- Feelings Of 'Accept Pain, Don't Complain' Among Many Japanese: "No country is more familiar with nuclear peril than Japan. The atomic bombs dropped on Hiroshima and Nagasaki in 1945, at the end of World War II, killed or irradiated hundreds of thousands of people, an event that dwarfs any nuclear incident since then.